The area where I live has extensive commercial pine forests (Pinus elliotii) just to the west. These are not a native species - and in fact my book on native plants lists them as a weed! They grow very well for a plantation timber but their seeds blow everywhere and if left unchecked soon grow into huge trees which take over. When I first came up here this housing sub-division was almost empty of houses and there were large pine trees scattered all over it. Most of them have now been cut down but next door to me there is still an empty block with two very large pine trees on it. The birds all love big tall trees like this. Sometimes birds just perch there, sometimes they nest there, and the parrots are always on the look out for pine cones with seeds just right for eating. 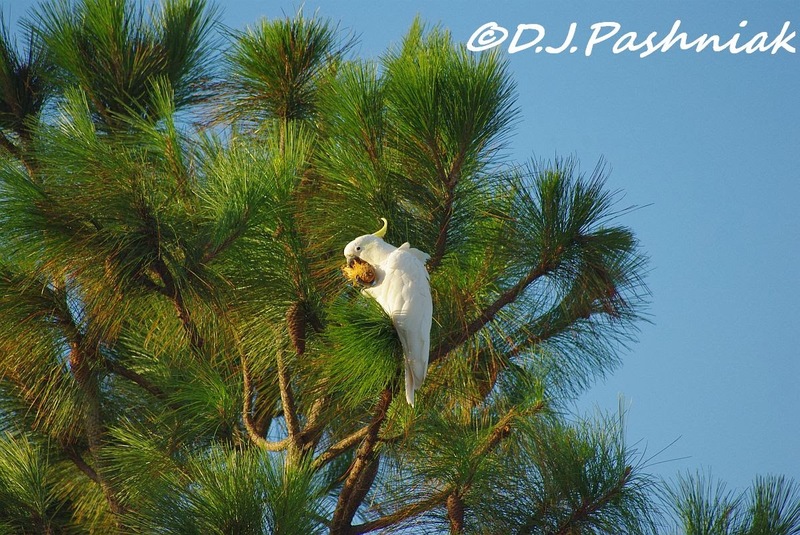 I went into my photo archives for this picture of the pine tree with a white Cocky (Sulphur Crested Cockatoo) enjoying the pine cones. The other morning I saw pine cones all over the ground - I think the Cockies had been sitting up in the tree and feasting on the cones. They usually start eating a cone and then drop the residue on the ground. This then makes a feast table for the Galahs. Galahs fly over my place most mornings but when they come down onto the ground they are especially fun to watch. They have a walk which is partway between a waddle and a strut! I counted 20+ the other morning - most sitting on the ground and eating from the cones which had fallen there but some also sitting and resting among the branches. Thanks EG for commenting. All the parrots look great but sound so noisy! Thanks Carol, they are fun to watch. It's so amazing to think of these birds as regular backyard visitors. They almost don't seem real! Hi Sally - your comment is so interesting to me because I wondered if I should post something so common this week! I guess the other side of the world is always different if you don't live there. Oh, you do indeed have colorful, beautiful birds in Australia!! Delightful!! Thank you so much, Mick, for sharing with us!! A terrific bright spot in a gray, rainy day!! Hope you have a great week! Thanks for commenting Sylvia. Wish I could share some of your rain - this district is drought declared - which should make it easier for the farmers to get some assistance from the various gov. depts. just wonderful birds you see! I love the big pine trees.. The Cockatoo and the Galah are both beautiful birds. Wonderful photos, enjoy your week! Thanks for commenting Eileen. I agree that the pine trees look great but the way they broadcast seeds which come up everywhere is not good! I have a few young trees - which I had missed - in my yard which need cutting. Those birds really stand out against the green of the pines. They obviously pay a part in spreading the seeds too. 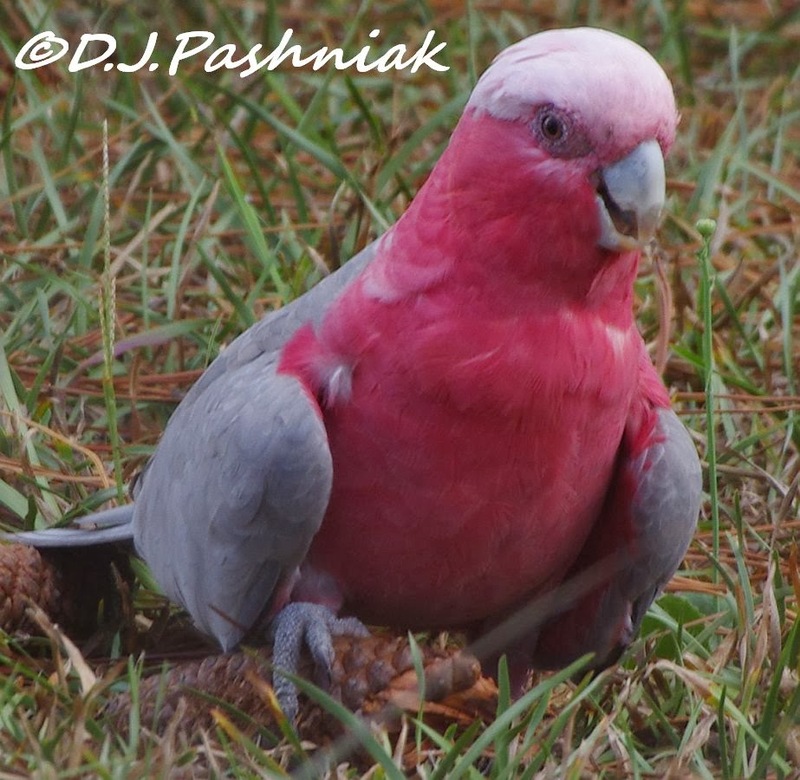 What a strong looking birds the galah is - tremendous legs and feet for gripping. Thanks for commenting Phil. There are so many seed-eating parrots around here - I do wonder what they ate before the pines were here. Thanks for commenting Carole - even the common birds can be fun to photograph. Hi Shey - we love tourists around here! Thanks for your comment. Thanks for your comment, Rajesh. Gorgeous birds! I'd love to see parrots in their natural habitat one day. Hi Gunilla, they look great but they are the noisiest birds you have ever hear! No chance of a sleep-in if they are around! Beautiful photos and interesting to see how birds use invasive plants. Thanks for commenting Christian. I guess people have the first responsibility since they brought the plants in! When I look at this guy he almost looks like he's laughing. Looks quite personable. Thanks for commenting Carletta. They are definitely fun to watch - they swing and squawk up on the overhead electricity wires also. They are such a beautiful bird, would I be right in thinking they are quite tollerent of people. Hi Gordon, my yard is totally fenced with wire fencing and the birds all seem to understand that neither I nor my cat or dog can get through to them - so they feel quite safe and happy only a few meters from us. I took all these photos through the wire but the camera focused on the birds not the wire. love these native characters! they are such entertainers! Thanks for commenting Judith. "Entertainers" is a perfect description of these birds. that parrot seems very special. With the color and shape they seem quite like one of a kind. Thanks for commenting NF. All the parrots are fun to watch and I think they are all a bit different. 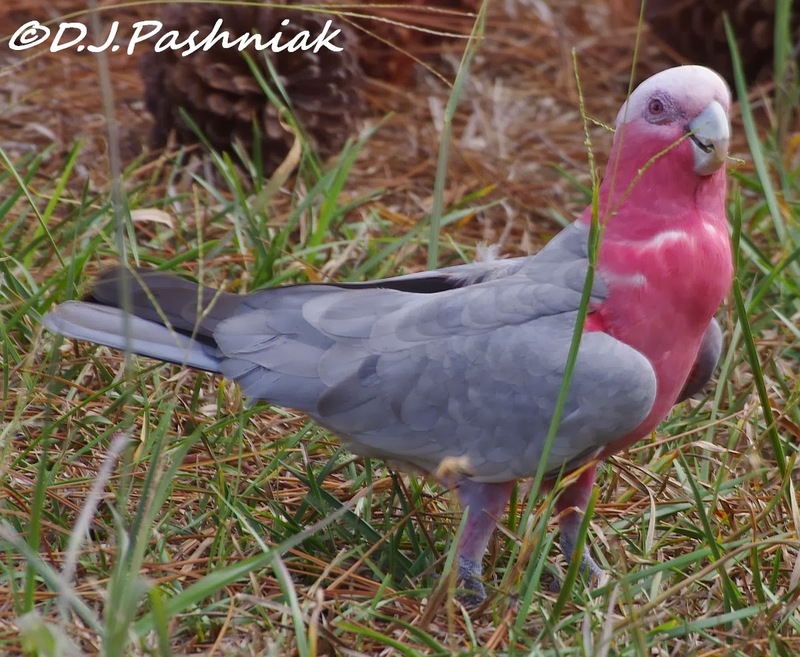 I don't know of any that are like the Galahs. That white bird in the beautiful tree against the blue sky: what a fortuitous combination. Looks like the lovely old pines are quite an attraction for these beautiful, colorful birds. Great captures. Thanks for commenting. Those pines are a menace to gardeners the way they pop up everywhere - I have a couple of small ones in the garden that need cutting out right now! - BUT the birds love them! What a beautiful bird, love those colours! Hi Chris, Parrots seem to be everywhere around the country but I think my place has more than usual! Interesting how the weed tree has become a popular food source. No wonder the trees are spreading! We may not have hummingbirds - but we do have parrots! Seems a reasonable trade to me. 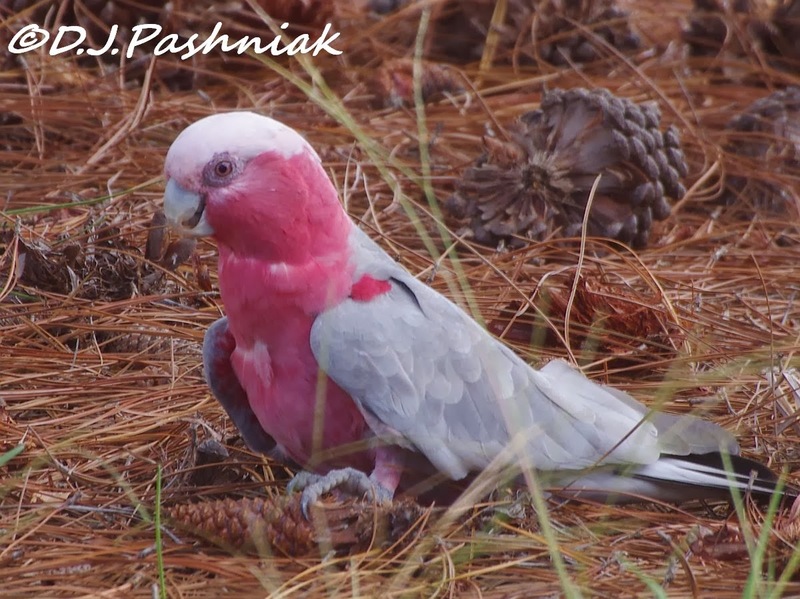 Terrific Galah portraits! They are such characters. I remember seeing what seemed to be hundreds in The Flinders. I had one as a pet (a rescued bird), when I lived in SA.